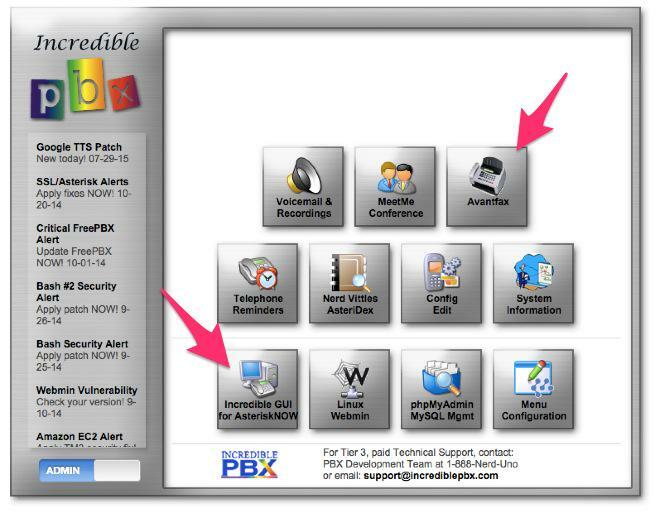 After frequent complaints from our FreePBX® users, we introduced a firewall application for the PBX in a Flash™ and Incredible PBX™ platforms that protected FreePBX resources. That was over 5 years ago. The product became Travelin’ Man™ 3, an IPtables-based WhiteList that totally eliminated access to your Asterisk® server unless a WhiteList entry had been authorized by the administrator. The application was further embellished over the years to facilitate access by remote users. First, we introduced PortKnocker™ for Asterisk® and later we introduced Travelin’ Man 4 to let users call in with a passcode to authorize server access. For the past several years, a preconfigured firewall has been an integral component in what has become the 7-Layer Security Model included in all Incredible PBX builds. TIP: Security is not a new idea for us. During this evolution, the FreePBX developers introduced their own distribution, the FreePBX Distro™. Conspicuously absent was a functioning firewall. We believed that the shortcoming would be remedied quickly. Hasn’t happened! In the meantime, a number of serious security vulnerabilities arose in the FreePBX product that compromised numerous servers running their distribution because of the absence of a functioning firewall. Digium® recently reintroduced AsteriskNOW™ as a clone of the FreePBX Distro. But still no firewall. About a month ago, we decided to close the loophole for everyone’s security and develop a firewall for the only FreePBX-based distributions without a firewall, the FreePBX Distro and AsteriskNOW. Last week we began the rollout with a Nerd Vittles article explaining why this was essential, as if an explanation were necessary. Today, you get the GPL code. Suffice it to say, our article was not well received. The usual Sangoma® players went into Damage Control Mode with what has become a predictable scenario whenever security issues are raised concerning the FreePBX design or vulnerabilities. The Good Cop offered to solve all your security woes if you’d just buy (some more Sangoma) hardware. The Bad Cop suggested that, with "cookie cutter security, you might as well hand out your password." Just in case you have any doubts about whose approach has stood the test of time, let’s Google the FreePBX Security Vulnerability Track Record. The Techie Cop claimed we had stolen his 2-day old idea to create an Open Source Firewall. Really? Earth to Techie Cop: Where have you been for the past five years?? Funny stuff… if it weren’t so damaging to the Asterisk community and those trying to decide whether to put their faith in open source communications software. We’ve written dozens of articles on Asterisk security and firewall approaches so we won’t repeat all of the information. Here’s what you need to know. Software-based firewalls on Linux servers need to be integrated into the Linux kernel to be secure. IPtables is kernel-based and extremely reliable. Blacklist-based firewall designs, i.e. those that seek to identify the IP addresses of every bad guy on the planet don’t work very well. Bad guys aren’t stupid. They can do their damage by commandeering a little old lady’s Windows machine so you’re never going to collect all of the necessary "bad" IP addresses. They’re also smart enough to poison the blacklists with Internet resources you need such as DNS servers. So don’t waste your time with blacklists. WhiteLists work very well. You identify the IP addresses and FQDNs of all the Internet sites you need to support and all the SIP providers you wish to use. Nobody else even sees your server on the Internet. If the bad guys can’t see your server, they can’t attack it. Simple as that. Travelin’ Man 3 WhiteList Tutorial. Travelin’ Man 3 also authorizes access for certain mandatory services that are needed to keep your server operating properly. In addition, during installation, Travelin’ Man 3 whitelists localhost and the public and private IP addresses of your server as well as your PC or workstation. You obviously don’t want to lock yourself out of your own server. As of today, Travelin’ Man 3 is primarily an IPv4 whitelist toolkit. IPv6 addresses are only supported to allow localhost access to your server. Any other IPv6 addresses must be added manually in /etc/sysconfig/ip6tables. We recommend not using FQDNs with IPv6 for the time being. And always restart IP6tables after adding new entries: service ip6tables restart. Once you have made your selection, a user account will be created in /root with the name of the account and an extension of .iptables. Do NOT delete these files. They keep track of current IP addresses and accounts authorized for server access. If you have remote users on the Internet, e.g. traveling salespeople, you can individually authorize access for them using a dynamic FQDN (add-fqdn) coupled with a dynamic DNS server that keeps IP addresses current as folks move around. Just load a dynamic DNS updater on their smartphone. Then plug the user entries into the included ipchecker script and execute a cron job on your server every few minutes to keep the FQDN entries refreshed. Simple. IPtables does not directly support FQDN rules through the kernel. However, IPtables lets you configure your firewall rules using FQDNs which get translated into IP addresses whenever IPtables is restarted. The gotcha here is that, if an FQDN is not resolvable, IPtables fails to load, and you’re left with a vulnerable server. Travelin’ Man 3 takes care of this by employing a special restart script that temporarily disables unresolvable IP addresses. ALWAYS USE iptables-restart TO RELOAD IPTABLES OR YOUR SERVER MAY END UP WITH NO FIREWALL! We’ve also included support for a neat little trick that lets you whitelist remote SIP access to your server using a special FQDN. No further firewall adjustments are necessary. This is supported on most platforms except OpenVZ containers. The way this works is you first assign an obscure FQDN to your server’s IP address. It needs to be obscure because anyone with the FQDN gains SIP access to your server. But chances are pretty good that the bad guys will have a hard time figuring out that xq356jq.dyndns.org points to your server. You then can embed this FQDN in the SIP phone credentials for all of your remote users. The final step is to uncomment the last few lines in /etc/sysconfig/iptables after plugging in your obscure FQDN. Then restart IPtables: iptables-restart. As you can see, there’s nothing "cookie cutter" about Travelin’ Man 3. It’s totally customizable to meet your own unique requirements. All we have done is tame IPtables and eliminate much of its complexity so that you can get a functional firewall up and running quickly. Now it’s deployment time! Installing Travelin’ Man 3 for the FreePBX Distro & AsteriskNOW. Stay tuned for Incredible PBX GUI, all of the GPL modules you know and love with NO NAGWARE and NO GOTCHAS. This also will assist users that got duped by the Sangoma offer to convert PBX in a Flash into a proprietary FreePBX Distro. After reading the Sangoma disclaimer about the script being donated by an anonymous user, ask yourself this question. When was the last time Sangoma republished code that they did not own or create themselves? Try NEVER.